An apomorphy is a character that is different from the form found in an ancestor, i.e., an innovation, that sets the clade apart ("apo–") from other clades. A synapomorphy is a shared ("syn") apomorphy that distinguishes a clade from other organisms. In other words, it is an apomorphy shared by members of a monophyletic group, and thus assumed to be present in their most recent common ancestor. The word synapomorphy—coined by German entomologist Willi Hennig—is derived from the Greek words σύν, syn = shared; ἀπό, apo = away from; and μορφή, morphe = shape. 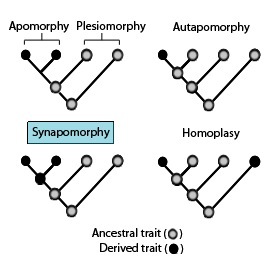 These phylogenetic terms are used to describe different patterns of ancestral and derived character or trait states as stated in the above diagram in association with synapomorphies. A new method of measuring phylogenetic characteristics is the use of Relative Apparent Synapomorphy Analysis (RASA). The objective of analysis is to determine if a given characteristic is common between taxa as a result of either shared ancestors or the process of convergence. This method allows for several advantages such as computational efficiency and it also administers an unbiased and reliable measure of phylogenetic signal. The concept of synapomorphy is relative to a given clade in the tree of life. What counts as a synapomorphy for one clade may well be a primitive character or plesiomorphy at a less inclusive or nested clade. For example, the presence of mammary glands is a synapomorphy for mammals in relation to tetrapods but is a symplesiomorphy for mammals in relation to one another—rodents and primates, for example. So the concept can be understood as well in terms of "a character newer than" (autapomorphy) and "a character older than" (plesiomorphy) the apomorphy: mammary glands are evolutionarily newer than vertebral column, so mammary glands are an autapomorphy if vertebral column is an apomorphy, but if mammary glands are the apomorphy being considered then vertebral column is a plesiomorphy. Cladograms are diagrams that depict evolutionary relationships within groups of taxa. These illustrations are accurate predictive device in modern genetics. They are usually depicted in either tree or ladder form. Synapomorphies then create evidence for historical relationships and their associated hierarchical structure. Evolutionarily, a synapomorphy is the marker for the most recent common ancestor of the monophyletic group consisting of a set of taxa in a cladogram. ^ a b c Roderick D.M. Page; Edward C. Holmes (14 July 2009). Molecular Evolution: A Phylogenetic Approach. John Wiley & Sons. ISBN 978-1-4443-1336-9. ^ Currie PJ, Padia K (1997). Encyclopedia of Dinosaurs. Elsevier. p. 543. ISBN 978-0-08-049474-6. ^ Concise Encyclopedia Biology. Tubingen, DEU: Walter de Gruyter. 1996. p. 366. ^ a b Barton N, Briggs D, Eisen J, Goldstein D, Patel N (2007). "Phylogenetic Reconstruction". Evolution. Cold Spring Harbor Laboratory Press. ^ Sánchez‐Villagra, Marcelo R.; Narita, Yuichi; Kuratani, Shigeru (2007-03-01). "Thoracolumbar vertebral number: The first skeletal synapomorphy for afrotherian mammals". Systematics and Biodiversity. 5 (1): 1–7. doi:10.1017/s1477200006002258. ISSN 1477-2000. ^ Williams D, Schmitt M, Wheeler Q (July 2016). The Future of Phylogenetic Systematics: The Legacy of Willi Hennig. Cambridge University Press. ISBN 978-1-107-11764-8. ^ Simpson MG (9 August 2011). Plant Systematics. Elsevier. Amsterdam: Elsevier. ISBN 9780080514048. ^ Choudhuri S (2014-05-09). Bioinformatics for Beginners: Genes, Genomes, Molecular Evolution, Databases and Analytical Tools (1st ed.). Academic Press. p. 51. ISBN 978-0-12-410471-6. OCLC 950546876. ^ Appel, Ron D.; Feytmans, Ernest. Bioinformatics: a Swiss Perspective. "Chapter 3: Introduction of Phylogenetics and its Molecular Aspects." World Scientific Publishing Company, 1st edition. 2009. ^ Sanderson MJ, Hufford L (21 October 1996). Homoplasy: The Recurrence of Similarity in Evolution. Elsevier. ISBN 978-0-08-053411-4. OCLC 173520205. ^ Archie JW (September 1989). "Homoplasy Excess Ratios: New Indices for Measuring Levels of Homoplasy in Phylogenetic Systematics and a Critique of the Consistency Index". Systematic Biology. 38 (1): 253–269. doi:10.2307/2992286. JSTOR 2992286. ^ Copetti D, Búrquez A, Bustamante E, Charboneau JL, Childs KL, Eguiarte LE, Lee S, Liu TL, McMahon MM, Whiteman NK, Wing RA, Wojciechowski MF, Sanderson MJ (November 2017). "Extensive gene tree discordance and hemiplasy shaped the genomes of North American columnar cacti". Proceedings of the National Academy of Sciences of the United States of America. 114 (45): 12003–12008. doi:10.1073/pnas.1706367114. PMC 5692538. PMID 29078296. ^ Lyons-Weiler J, Hoelzer GA, Tausch RJ (July 1996). "Relative apparent synapomorphy analysis (RASA). I: The statistical measurement of phylogenetic signal". Molecular Biology and Evolution. 13 (6): 749–57. doi:10.1093/oxfordjournals.molbev.a025635. PMID 8754211. ^ Simmons MP, Randle CP, Freudenstein JV, Wenzel JW (January 2002). "Limitations of relative apparent synapomorphy analysis (RASA) for measuring phylogenetic signal". Molecular Biology and Evolution. 19 (1): 14–23. doi:10.1093/oxfordjournals.molbev.a003978. PMID 11752186. ^ Novick LR, Catley KM. Understanding phylogenies in biology: the influence of a Gestalt perceptual principle. J Exp Psychol Appl. 2007;13:197–223.